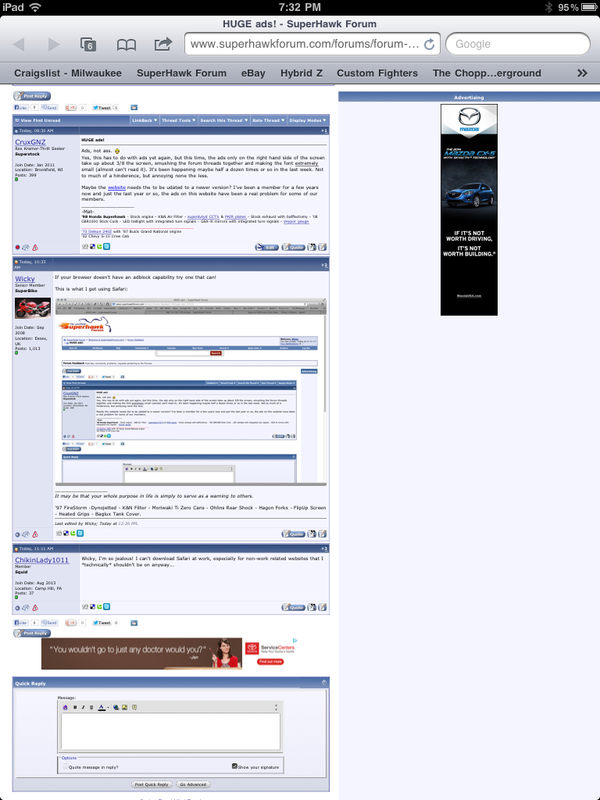 Yes, this has to do with ads yet again, but this time, the ads only on the right hand side of the screen take up about 3/8 the screen, smushing the forum threads together and making the font extremely small (almost can't read it). It's been happening maybe half a dozen times or so in the last week. Not to much of a hinderence, but annoying none the less. Maybe the website needs the to be udated to a newer version? I've been a member for a few years now and just the last year or so, the ads on this website have been a real problem for some of our members. If your browser doesn't have an adblock capability try one that can! Last edited by Wicky; 09-25-2013 at 10:26 AM. https://extensions.apple.com > AdBlock banishes all ads on all web pages. Once you install AdBlock, you’ll immediately see the results. Visit your favorite websites and watch as ads disappear. Down load Google Chrome, then add "Ad Block Plus" for free. No more ads on anything, ever. As far as a smart phone, i have no idea. With Ad Block Plus on Chrome you won't get annoying commercials on youtube videos or anything. You can also download "Do Not Track Me". This website has 8 companies trying to track me right now. The most out of all the websites I visit. I did the same as most above on my home machine with Adblock. But I haven't found anything effective for iPad or iPhone. Still, it is free to us so I guess something has to pay for the server upkeep. Thanks very much! Works very well now. I don't see the huge ads, but I do see random words underlined like a link. When you run your mouse cursor over the word, an advertisement pops up. It's annoying. I have a popup blocker on my Chrome browser. I just started getting huge ads again. And, as much as I love using Dolphin as a browser for the iPad, it hasn't been updated for a few years now and the ads started coming back. Just as I start looking for a new browser and not finding anything I like, I decided to open Dolphin again and...what the heck? It has a different look to it. And, there are no ads on this forum! Holy crap, Dolphin was updated! It is so very nice to browse the internet with no freakin' ads! If you are having issues with popups and ads, check out Dolphin for a new browser.